I Have, Who Has? Multiplication Game. Great for math centers! Print on Card Stock for a long lasting game! This game is great for whole group or small group. Use it as a fun was to practice multiplication facts. This includes all multiplication facts from the 2's to the 12's. The game is easy to play. Each student gets a card. The student reads the card to find the next player. 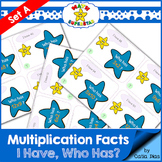 This is a fun game to review and practice multiplication facts with 7, 8, and 9. There are 30 cards included with 6 blank cards for you to add more. Have fun multiplying! My students love playing games - they don't realize they are learning while they play! 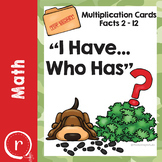 I have.... who has..... multiplication facts lets students practice multiplication facts up to 12 x 12. There are 30 cards in this set. 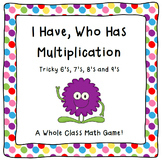 This is a fun game to review and practice multiplication facts with 5, 6, and 7. There are 30 cards included with 6 blank cards for you to add more. Have fun multiplying! 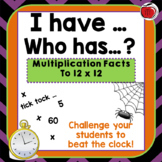 Want to get your students excited about learning their multiplication facts? Try this fun I have who has game with a karate style theme.